Braille is a tactile writing system intended for being read with ones finger tips instead of visually. It was developed in the 19th century by a young Frenchman who had lost his eye sight due to a childhood accident. Traditionally, braille was embossed on thick paper, but today there are also refreshable tactile displays available that can be connected to computers. To write in Braille, one can use a slate and stylus, or one of several different braille writers that have been developed. 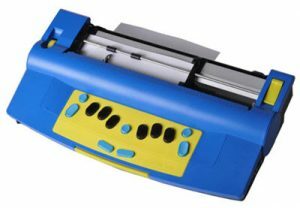 Modern braille writers can be connected to computers and function as computer printers. 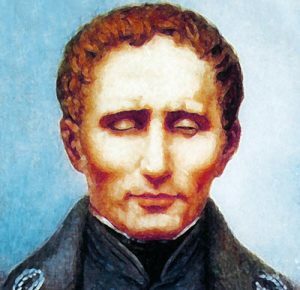 Braille was created by Louis Braille (4 January 1809 – 6 January 1852) who had become blind after a childhood accident. In 1824, the fifteen year old Louis developed a code for the French alphabet based on an older system created for soldiers writing in the dark. Louis published his system in 1829, with a revised version being launched in 1837. The revised version was the first small binary form of writing developed in the modern era. Today, we celebrate World Braille Day on Louis birthday (January 4th) each year to commemorate the creation of braille and Louis Braille’s great contribution to promoting literacy among the visually impaired. Braille script is based on rectangular blocks called cells. Within each cell, there are raised dots that you can feel with you finger tips when touching the paper. The number of dots and how they are arranged within the cell will tell you which letter or sound the cell corresponds with. A standard Braille cell has room for six dots, arranged in two columns with each column consisting of three dots. 64 different combinations are possible by varying the number or dots and their location within the cell. A cell can be used to represent a letter, a number, a sound, or a punctuation mark. Sometimes cells with room for eight dots instead of six are used in Academic texts, to make more than 64 combinations possible, thus increasing the number of symbols that can be used. Braille is not a universal language; an English-speaking person will use English Braille, a French speaker will use French Braille, and so on. The various braille alphabets originated as transcription codes for non-braille writing in national languages. Grade 1: A letter-by-letter transcription, where each braille character corresponds with one letter from the English alphabet. This is used for basic literacy. Grade 2: Grade 2 encoding includes abbreviations and contractions, and certain English sounds can be represented with just one braille character. It is for instance possible to write the sound “th” (in words such as think and thunder) using just one braille character instead of writing out the respective characters for t and h.
Grade 3: Grade 3 encompasses various non-standard personal stenography. Most braille alphabets follow the French sorting order for the 26 letters of the basic Latin alphabet, but then diverge to accommodate for letters specific to each national alphabet. An alternative to this is to assign braille characters according to frequency, with the least complex patterns being assigned to the most frequently used letters or sounds. This assignment methods is not at all common today, but was popular in countries such as the USA and Germany in the 1800s. Japanese Braille and Korean Braille does not order the codes numerically at all, since they base braille on syllable composition. In addition to the basic cells, other things can appear in braille texts, such as embossed illustrations, graphs, arrows, bullets, etc. The lines used to create these patterns can be solid or consist of a series of dots.